A conference about data hardly sounds unique these days, however those who have been will know that BDB is different. 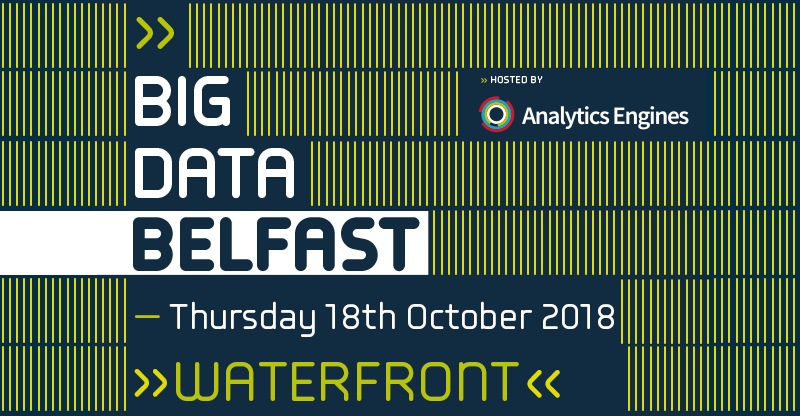 Analytics Engines is proud to once more host the Big Data Belfast conference; a unique collaborative platform sharing best practice in big data analytics. This isn’t a vendor showroom (although many do make vital connections at the event); this is an event where everybody is interested in how data can be best used to transform their operations. Each talk and workshop is packed with real-world examples of how people have learned how to gather, ingest, analyse and visualise data in ways to unlock value in their organisation. Over the years, healthcare has become an increasingly popular topic and BDB2018 will have a dedicated session focusing on the use of data in improving healthcare delivery. Speakers confirmed for the healthcare session have a hugely impressive record in delivery of data-driven solutions that make a meaningful impact in care delivery. With the publication of the NHS Code of Conduct for Data-driven Health and Care Technology, plus good progress against the HSE eHealth Strategy there is active encouragement at a policy level for innovative data solutions to deliver on the promise of better, and more sustainable healthcare. If you are interested in attending this years Big Data Belfast conference you can book tickets here!